I’ve been away for a few weeks (well away from the world of blogging). We’ve been away as a family and fallen in love with Portland (a small island just off Weymouth) but mostly I’ve been trying to get my thoughts together. I’ve got a few things in the pipeline which I’m trying to get sorted out. First of all my friend has just set up her own business selling handmade cards and jewellery (http://www.delightyourselfcards.com/) and we’re looking into how we can do stuff together. This Saturday we’re throwing a girls only Tea Party, with tea and cakes and Pimms. I love what’s going on at the mo with the revival of all things vintage. I love the 30’s, 40’s and 50’s inspired patterns and prints as well as the idea of a quaint English garden party. Therefore when deciding what to do we decided to have a Garden Party with afternoon tea. Our main aim is for the girls to get together and have fun but there will also be a chance to browse and buy our stuff if they want to. I’m having lots of fun making bunting and vintage style decorations. I’ve already got the tables and chairs ready. Hopefully this will be more enjoyable than just going to a sale. Anyway a lot of preparation has gone into this, so busy week! Secondly I’m looking at setting up a Folksy shop. If you’ve never come across folksy before it’s well worth a look. It’s very similar to Etsy (a US site) but it’s a UK site. They have beautiful handmade items, made by sellers such as myself. I’ve been using the site as a way of finding presents for friends (we just have a couple of your bog standard shops near us, which makes it very difficult to buy interesting and ‘different’ presents), and have finally decided that I’ll try selling my stuff on it too. It’s taken quite a bit of work and isn’t quite ready yet. I’ve had to take pictures of all my stock as well as design some new items to sell on it. I’m currently working on sock creatures and tote bags that are reversible. I’ve had some success but am still not quite there. It all takes a lot longer than you would think! I’ll post when everything is up and running. Thirdly as a way of testing the water and tying things together I have been sorting out a facebook fan page (see the link on the right). Again this has taken a little more work than one would think it would. 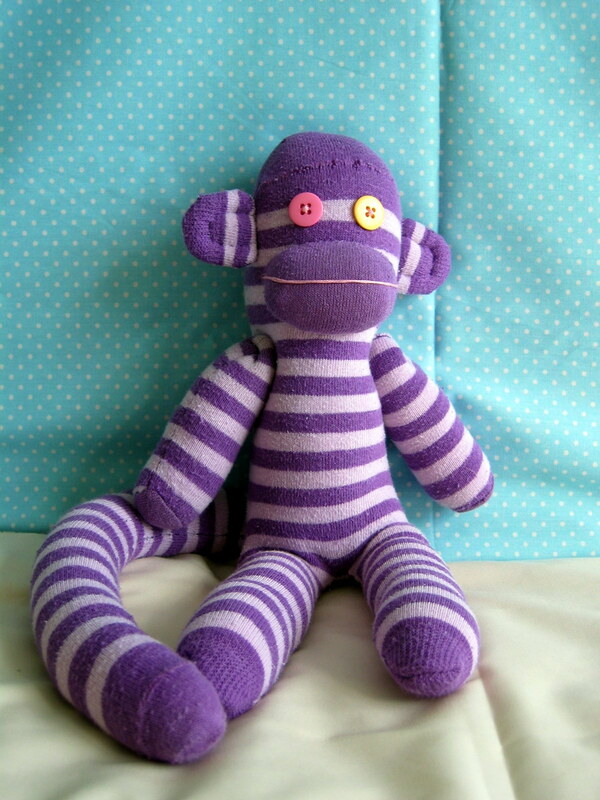 Finally, Sarah (my friend) and I have been looking at whether it would be possible to run workshops for people to learn basic crafting techniques or as an alternative party idea (so have workshops on making sock monkeys, designing and making cards, making jewellery etc). When we were away I went into a little wool shop (as I often do) and towards the back was a lady sitting at her sewing machine. I realised that in an ideal world I’d love to have a similar shop where I could sell my stuff, sit at the back working on new stuff, but also use it as a place for workshops or for crafty people to get together and sew or knit; share projects; help each other out. As you already know, I get a sewing magazine called Sew Hip and recently they’ve started having a monthly article written by the people who run The Makery in Bath. It’s really inspired me. I love the idea of having something like that in my area. Oh well, we’ll see. I can’t see anyway of it happening in the near future but there is no harm in planning ahead. Sarah and I can start small and see what works.